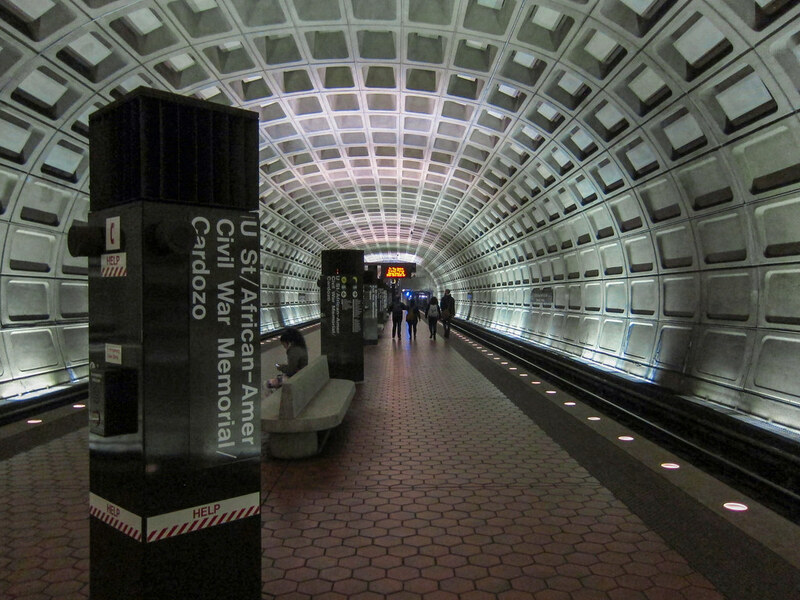 There is some disagreement over whether the Metro stations in Washington, DC, are Brutalist in design. But it’s hard to disagree that they are distinctive. On our recent vacation in DC, we stayed in Maryland (because hotels in DC are stupid expensive) and rode the Metro everywhere. It worked out great. The trains were clean (though well worn) and on time. I’m no fan of Brutalist architecture. It has the grace of Soviet design and the class of a punch in the mouth. But of late I’ve grudgingly admitted that it is worthy of preservation. 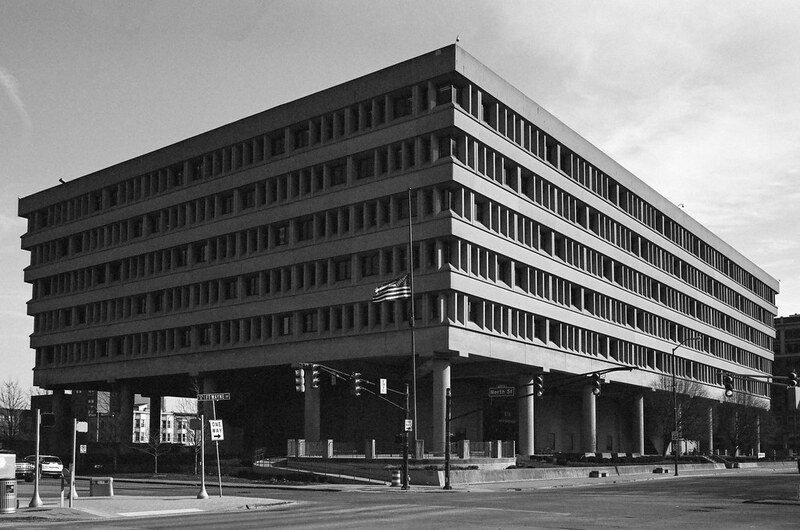 Indianapolis has a fabulous example of the form: the hulking Minton-Capehart Federal Building. It’s Downtown. You need no directions — just drive around and you’ll find it. You can’t miss it. This pathway leads to the building’s entrances. 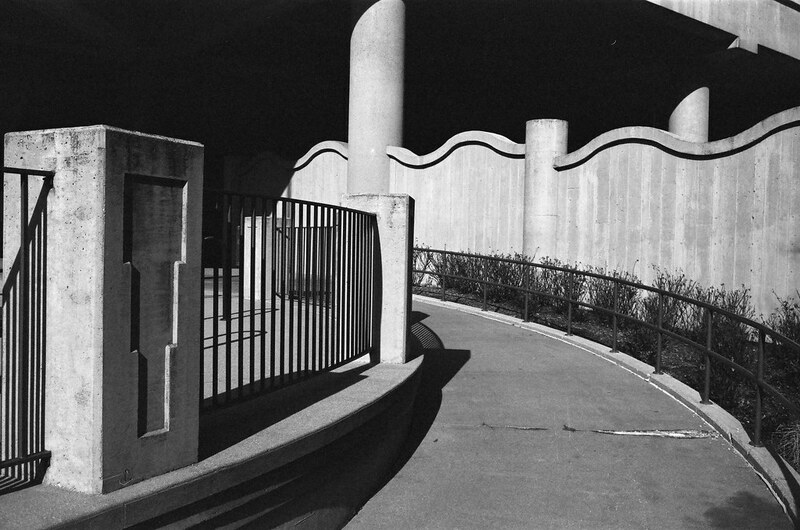 I think it was Mike Connealy who wrote on his blog about being hassled by security when photographing a federal building where he lives. I mentioned that the next time I took a photo walk Downtown I ought to liberally photograph our federal building and see if I would be similarly accosted. I did it recently, making five or six photos of this building while on the property, in probably a ten-minute span. I was left alone. Perhaps I just went unnoticed. This photo from across the street benefits greatly from my 35mm lens. It was no trouble at all to fit this giant into my frame. I did have to tilt the camera up to avoid the top from being cut off, which created perspective error. A quick hit of Photoshop’s perspective-correction tool made the top of this building jut out properly.